Sibley-Smith Industrial Park is zoned heavy industrial (HI) and is situated 2 miles north of the US Hwy 441 business & bypass intersection. Norfolk Southern Rail and utilities are already on site. 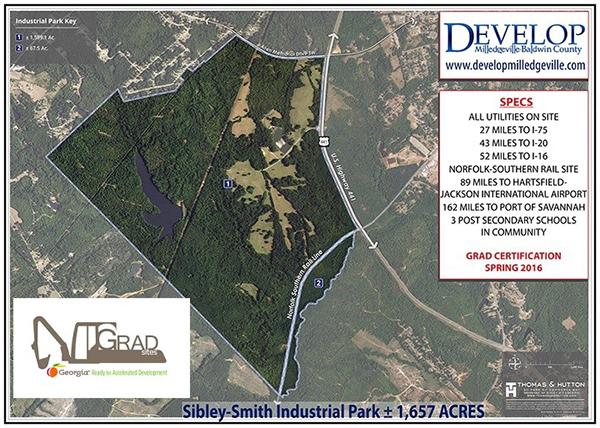 Certification – GRAD Certified by Georgia Allies – (Georgia Ready for Accelerated Development) Due diligence includes these factors; Minimum of 50 Acres, Ownership security, Zoning designation, Road and rail accessibility, Utilities service, Wetlands and Stream Delineation.